This Thursday we will participate to our first ‘Stoffenspektakel‘. For those that live abroad: it’s a big indoor fabric market organised at several location in the Netherlands, Belgium and France. :) This blogpost is only about convincing you to come to our stand! Haha! Of course the main reason is to buy patterns! We will bring all our paper patterns with us. And we would not be Compagnie M. if we’d not threat you with a great action. 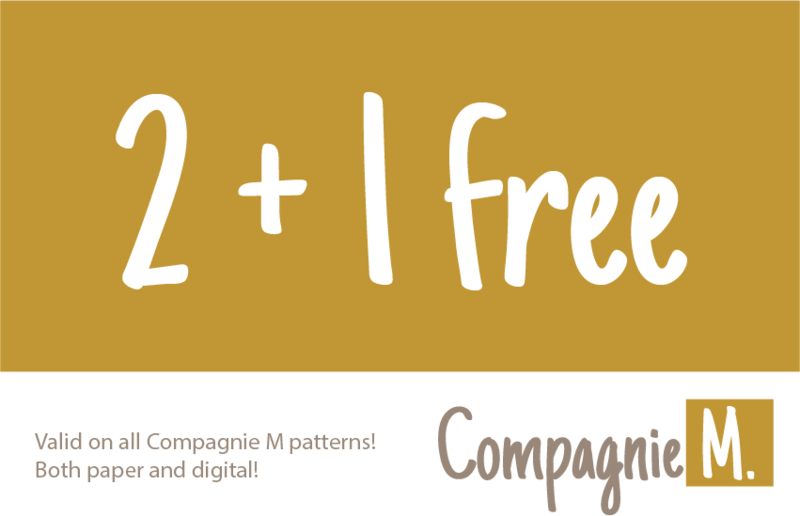 All patterns are 2 + 1 for free! Paper ones but also our digital patterns can be bought with this amazing reduction. In this case you’ll take your free unique download code home with you. If you buy 3 paper patterns the price will be 32euro / 3 patterns or 10,67euro / pattern. For the digital versions you pay 14euro / 3 patterns or 4,67euro per pattern! Only valid at the fair. You might have noticed on my Instagram? We will also be selling high quality industrial sewing thread (Amann, Coats, DMC,…): both suitable for your serger or your sewing machine. You might be wondering why we are selling thread? Well that’s actually Bjorn’s ‘fault’. He wanted to buy me an industrial sewing machine at an auction and along he bought a lot of thread. Too much for me to use in my whole life, so we are selling some of this stock. I have … actually all colours of the rainbow. Since the thread is from a towel factory that closed down, some is new and some has been used. I should not tell you that the quality is amazing? Did you every cut yourself on thread? I did several times when I was preparing 4packs for you! It’s impossible the ‘break the thread’ by hand and I tried this several times. Oops! The BIG advantage is that we will offer the cones per 1.000 – 2.000 – 3.000 – 4.000 or 5.000 meters! This way you can buy full (new) cones or buy several smaller (used) cones for the same price. 4 x 5.000 meters (full cones) will costs 20 euro (normal price is 50euro!!!) so actually 1euro per 1.000 meter. That’s a bargain. If you decide to buy several colours you can buy 4 x 1.000 meters cones for only 4euro. A good way to invest some of your favourite colours! Single cones can be used on your regular sewing machine and will be 2euro. Did you know that Gutermann thread costs about 3,50euro / 200 meters? So 1.000 meters for only 2 euro is a great deal too! And if you buy 10 colours you get 2 for free. 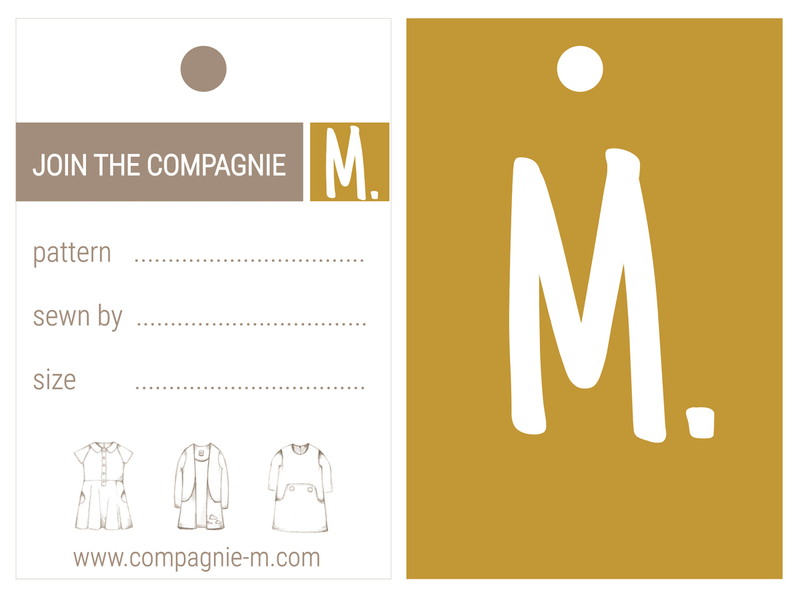 A third important reason to visit us is to participate in our ‘join the Compagnie M. action’. Bring your handmade Compagnie M. clothes with you and swap some for free paper patterns! More details can be found in this blogpost. All creations that we swap with you will be used as presentation material at our stockists! Ooh, ik wou dat ik kon komen!! Alleen echt teveel verhuisdrukte hier helaas…. Veel succes in elk geval!! Succes donderdag én geniet ervan! Jammer dat je niet in Hasselt stond.